analytical charaterization of materials from prehistory (megalithic) to classical times (Greek and Roman). It will also be open to professionals in the Museum/Conservation sector that requires updating their knowledge and personal skills in in this highly specialized field providing they are holder of a Bachelor (I cycle) degree and possess an excellent academic background in the general fields of Archaeology-Museology-Conservation science-Cultural Heritage. Candidates who will only obtain their first higher education degree at the end of the academic year preceding the one concerned by the scholarship application can nevertheless apply for a scholarship and be selected by the consortium concerned, under the condition that they acquire the required degree prior to the beginning of the masters course edition concerned. More information about linguistic skills required can be found here. 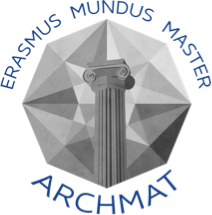 Applications to the Archmat: Erasmus Mundus Master in Aarchaeological Materials Sciences can only be submitted online. Please note that you need to register first by filling your name and email address. You will be then sent an email with a link where you will validate your registration and select a password of your choice to be used when you enter the Application procedure database. Deadline is at 23.59 hours CET on the 15 of January 2013.